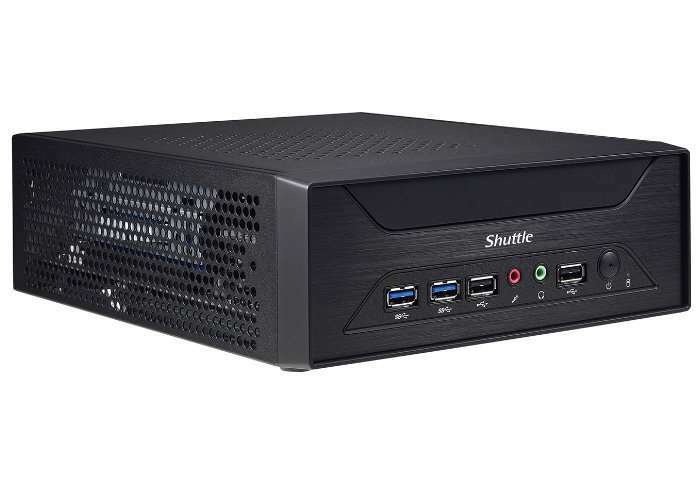 Shuttle has unveiled a new addition to their range of XPC systems this week, with the unveiling of the Shuttle XH110G which is now available from resellers throughout Europe priced at €231. The XH110G is equipped with an Intel H110 chipset can accommodate up to 32 GB of DDR4 memory and Intel processors (LGA1151) with up to 65 W of TDP. Other features include two M.2 slots, one being M.2-2280 and one M.2-2230, which could accommodate an NVMe SSD and a WLAN module, or M.2 add-on cards if desired. Supported operating systems include Windows 10 64bit, Windows 7 32/64bit (Skylake only) and Linux. Not only PC gamers will be interested in the fact that here it is even possible to combine an NVIDIA GeForce GTX 1050 Ti graphics card with a Core i7 processor and 32 GB of RAM. The XH110G also makes multi-display scenarios a reality or has the room for just the required expansion for a special project.